Net neutrality advocates in the US faced a huge setback at the end of 2017. 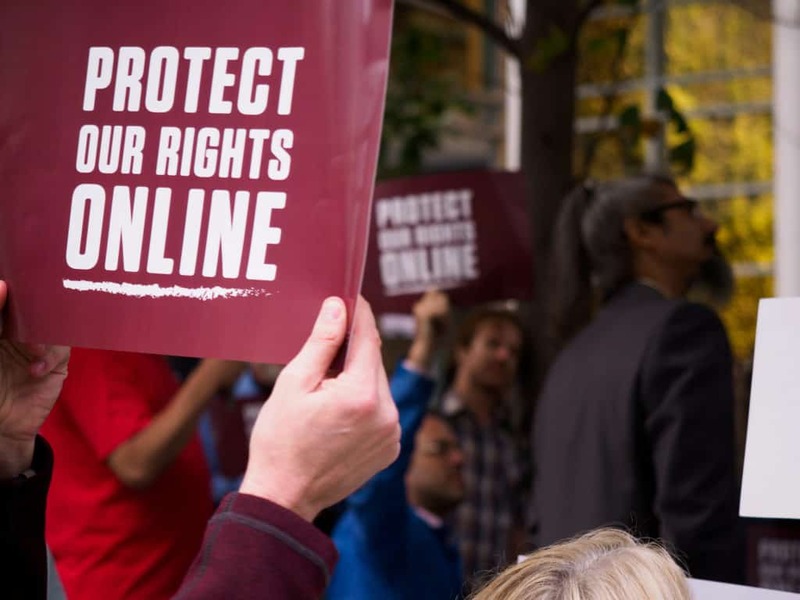 Despite overwhelming support for rules that ensure all internet traffic is treated equally by internet service providers, corporate interests took precedent. The FCC on December 14 voted to deregulate broadband providers and eliminate rules that forbade ISPs from blocking websites, throttling services, and censoring online content. The fight is still ongoing. It will take time for the rule change to take effect. Meanwhile, members of Congress on both sides of the aisle posit legislation that would enshrine net neutrality, or lack thereof, into law. How this all will affect consumers in the US remains to be seen, but ISPs have abused their gatekeeper status prior to the recent repeal. Now they have the technical ability, business incentive, and legal right to do so. Through various means, ISPs can now funnel users towards content that benefits them and their allies and away from content that doesn’t server their interests. No matter how the future plays out, a VPN can help ensure net neutrality, at least on an individual level. Short for Virtual Private Network, a VPN encrypts all of a device’s internet traffic and routes it through an intermediary server in a location of your choosing. This guarantees that your ISP cannot discriminate based on the traffic’s content or its destination, because the ISP can see neither. ExpressVPN Our #1 pick. Best-in-class security and privacy features and super fast servers dotted around the globe. Includes 30-day money back guarantee. NordVPN Low-cost provider with adequate privacy and security in place. Plenty of servers to choose from. CyberGhost Budget provider with beginner-friendly apps and ample security. IPVanish Fast, secure and private connections. Good unblocking capabilities. PrivateVPN Up-and-coming network that places a high emphasis on security and privacy. No logs of your activity, nor any other information that could identify you based on how you use the VPN. ExpressVPN employs cutting edge security and privacy standards to ensure no one can snoop on your online activity. 256-bit AES encryption is paired with perfect forward secrecy for an uncrackable secure tunnel. The desktop apps come with best-in-class protection against any DNS, IPv6, and WebRTC traffic, even if the connection is somehow disrupted. An optional kill switch, called a “network lock” in ExpressVPN parlance, halts all internet traffic should the VPN connection drop, preventing unencrypted traffic from traveling over your ISP’s network. The company keeps no logs of users’ activity nor how they use the VPN, as evidenced by a high-profile raid on its servers in Turkey that turned up no useful information for investigators. ExpressVPN has spoken up in support of net neutrality on several occasions. Users will also find that ExpressVPN is one of the most reliable unblockers of geo-locked streaming video sites like Netflix, Hulu, HBO, Amazon Prime Video, and BBC iPlayer. You’ll find speeds are fast enough to easily download large files and stream high quality video. One subscription allows you to connect up to three devices at the same time. best VPN for net neutrality:ExpressVPN is our #1 Choice. It has a vast server network that is optimized for high-speed connections. User-friendly apps for all operating systems. Hard to beat on privacy and security. There is a 30-day no-quibbles money-back guarantee so you can try it risk-free. NordVPN goes the extra mile when it comes to security. In addition to military-grade encryption and protection against DNS and IPv6 leaks, NordVPN boasts specialized servers for additional privacy, stability, and speed. These include VPN over Tor, double VPN, anti-DDoS, and ultra-fast streaming servers. In addition to those, NordVPN subscribers get access to more than 1,000 servers worldwide. The company adheres to a strict zero logs policy, and past raids on data centers have turned up no data that could identify a specific user. NordVPN is also a capable unblocker of streaming sites like Netflix, BBC iPlayer, Amazon Prime Video, and Hulu. Speeds are middle-of-the-road, but connections are stable enough to stream decent quality video without buffering. A single plan allows up to six simultaneous connections. BEST BUDGET VPN:NordVPN is great value. A real contender in all categories. Has strong security features and allows up to 6 devices to be used simultaneously from one account. Includes a 30-day money back guarantee. CyberGhost allows its users to select a server not just based on location, but on how they plan to use it. You can select among profiles for anonymous browsing, torrenting, streaming, and securing public wifi. 256-bit encryption plus perfect forward secrecy secure your connection, no matter which profile you choose. You can also toggle some extra features like anti-malware and anti-tracking. CyberGhost can unblock a handful of streaming sites like Netflix, Hulu, Amazon Prime Video, and BBC iPlayer. The company keeps no logs of what you look at nor any metadata that could identify the user. DNS leak protection is built in. BUDGET CHOICE:CyberGhost has a simple set up. Great privacy, zero logs and DNS leak protection. Can struggle with some popular streaming sites. 45-day money back guarantee. IPVanish is a veteran VPN provider with a vast server network that spans the globe. The apps use 256-bit encryption and perfect forward secrecy, a best-in-class combination when it comes to VPN security. The company stores no logs of any sort about its customers’ use of the service. IPv6 and DNS leak protection come built in. You can even choose how often your IP address changes while connected. IPVanish is a favorite among Kodi users thanks to its easily-downloadable APK file, remote control-friendly interface, and ability to work with any Kodi addon. IPVanish even offers an app tailor-made for Amazon Fire TV Stick, a popular device to install Kodi on. Thanks to sturdy connections and unlimited bandwidth, IPVanish users can stream as much video as they want without buffering. PrivateVPN is the youngest provider on this list, but it certainly competes with its veteran rivals. 256-bit and 128-bit encryption are both solid options for encryption, each paired with perfect forward secrecy. The company sticks to a clear cut no-logs policy that ensures no record of your activity on the service is stored. The company recently implemented its own private DNS servers, and the apps protect against DNS and IPv6 leaks. You can connect up to six devices at a time on a normal plan. PrivateVPN outdoes most other paid VPNs on the market when it comes to unblocking geographically restricted content. You can use it to bypass firewalls on sites like Netflix, Hulu, BBC iPlayer, Amazon Prime Video, and more. GREAT FOR SPEED:PrivateVPN is consistently reliable. Good for general purpose use. Speeds were surprisingly good at this end of the market. Privacy and security are solid. Could do with having more servers and lacks 24/7 support. 30-day money back guarantee. We generally advise against using so-called “free” VPN services. By and large, these are not charitable services, and instead make money by mining personal data from their users to in turn sell to advertisers. Some free VPNs insert advertisements straight into your browser, some inject tracking cookies, and a few even carry malware. In one high profile case, a privacy advocate group filed an official complaint with the FTC against popular free VPN Hotspot Shield. Hotspot Shield allegedly hijacked HTTP requests to certain ecommerce sites and redirected users to affiliate websites where it stood to make a profit. That’s the exact opposite of net neutrality and stands as a stark reminder that free VPNs just don’t cut it. The handful of reputable free VPN services tend to have much a much more limited selection of servers, most of which are too congested to do anything more than basic web browsing. Data is capped, bandwidth is limited, and in some cases you might have to wait in a queue before connecting. If you want a VPN but are worried about committing to a subscription, consider taking advantage of the free trial or money-back guarantee periods of the VPNs recommended above. How can a VPN help ensure net neutrality? Rather than indulging in hypotheticals, let’s look at some real examples of past net neutrality violations and explain how a VPN could help in such situations. In 2014, Verizon and Comcast slowed down their customers’ connections to Netflix in order to force Netflix to pay them for using up so much bandwidth. Of course, it’s the end users who suffered most. In this case, a VPN would bypass the ISPs’ throttling efforts, because they wouldn’t be able to make a distinction between Netflix streams and any other type of internet traffic. In 2010, DSL provider Windstream hijacked its customer’s search queries and redirected them to its own search engine and results. In 2011, several small ISPs pulled a similar stunt wherein search results were skipped over entirely and users were sent directly to an affiliate site from which the ISPs would earn referral fees. With a VPN, ISPs cannot see your search queries, so this could have been bypassed. And in 2008, the FCC ruled that Comcast discriminated against peer-to-peer traffic and sent users false error messages. When connected to a VPN, everything you do online is “protocol agnostic,” meaning your ISP can’t distinguish data being downloaded from BitTorrent from other types of traffic, and therefore cannot block or throttle it. Does my ISP allow VPNs? VPNs are 100 percent legal in the United States as well as most other countries. We know of no ISPs in the United States that prevent or penalize VPN use. When connected to a VPN, your ISP cannot decipher the contents of the data traveling to and from your device. It also cannot see where that data is coming from or going to. All the ISP sees is jumbled text going to a data center in the location you connected to. While it’s possible that an ISP might know whether or not you’re connected to a VPN, that’s about the extent of what they can find out. Everything else you do online is private.